Iran has dramatically increased its monthly oil output after opening three oilfields since international sanctions were lifted in January . 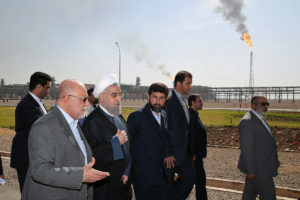 President Hassan Rouhani was on hand for the opening of the Yadavaran oilfield. President Hassan Rouhani officially launched the first phases of the Yadavaran and North Azadegan fields as well as the North Yaran field, which are shared with neighboring Iraq, the Iranian oil ministry’s news agency SHANA reported. The three oilfields currently have a total production of more than 220,000 barrels per day (bpd). Yadavaran will have a production of up to 115,000 bpd in its first phase and North Azadegan’s output is 75,000 bpd, SHANA said. North Yaran will initially produce 30,000 bpd, the news agency reported last week. Iran has now almost recovered the production capacity lost to sanctions, and plans to further increase output with the help of foreign investment.